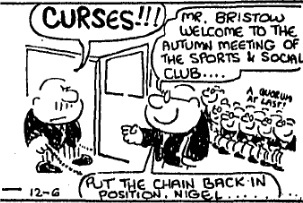 Strip 2861 was published in the Evening Standard in May 1970, in Bristow (1970) and in Bristow (1972). Perhaps a reason for the hostility is that each year the meeting cannot start until there is a quorum. Ranges of tricks are employed to bring members into the room. One year it may be trails of coins (followed by Atkins of Accounts), trails of sawdust (followed by the carpenter) and trails of paper clips (followed by Bristow); another year detour signs are placed in the corridors forcing the departing clerks into a one-way system that leads to the meeting room. The Sports side is not noted for its achievements. One year there is only member active in Judo, Karate and Weightlifting. The AGM votes to close them down - unfortunately no-one volunteers to be the person to break the bad news to the sole member who is working out in the gym at that moment. (Not too surprising really, seeing as that man happens to be Muscles Maddox the firm's bully). Aside from the Dinner & Dance the Social Club tries to put on various festivities. Things are livened up when one of the waitresses - Dolly "Fun Fun" White becomes president. She plans a Halloween rave up, a Christmas Caper, a New Year Knees up, a Valentine day thrash and many more. The Halloween party (which is a life-saver for Bodega Brothers) is ruined when a drunken hobgoblin abuses the barman, jeers at the assembly, throws wine over the M.C. and attacks the band with a witches broomstick. Bristow remarks thoughtfully "I didn't know Peterson of Public Relations was interested in the supernatural ". It seems likely that the rest of Dolly's imaginative programme vanished under a welter of apathy because little more is heard of it.